There are only two things that will decide whether you like Roger Waters' new album or not: 1) Are you a fan of Water's previous music and 2) Are you a supporter of Donald Trump. If you are a fan of Waters' previous music, mostly his solo stuff but also some of his material from the Pink Floyd albums he performed in, you'll find plenty to love on "Is This the Life We Really Want?" As far as music is concerned, this CD is one of Waters' best, featuring the eerie, unique rhythms and Waters' one-of-a-kind vocal style. The lyrics are deep and brilliant and really mean something. Rogers asks some difficult questions and offers some blunt opinions and, on this outing more than any previous one, you can tell that his heart is really into it. "Is This the Life We Really Want" is serious and scared and thoughtful. 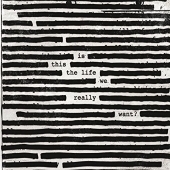 It's probably the closest a recording has ever come to capturing the real, the raw, Roger Waters and that alone makes it special. The second consideration here is if you're a supporter of Donald Trump. If you are, do not bother with this recording. Waters pulls no punches when it comes to what he thinks of this particular commander-in-chief. This is where the "blunt opinions" comes into full force. So that's what it comes down to: Are you a fan of Roger Waters' style of rock'n'roll music and are you a Trump supporter? Yeah, I give it a full four guitarsaws. For more information, check out http://rogerwaters.com. Copyright © 2017 by R. Scott Bolton. All rights reserved.